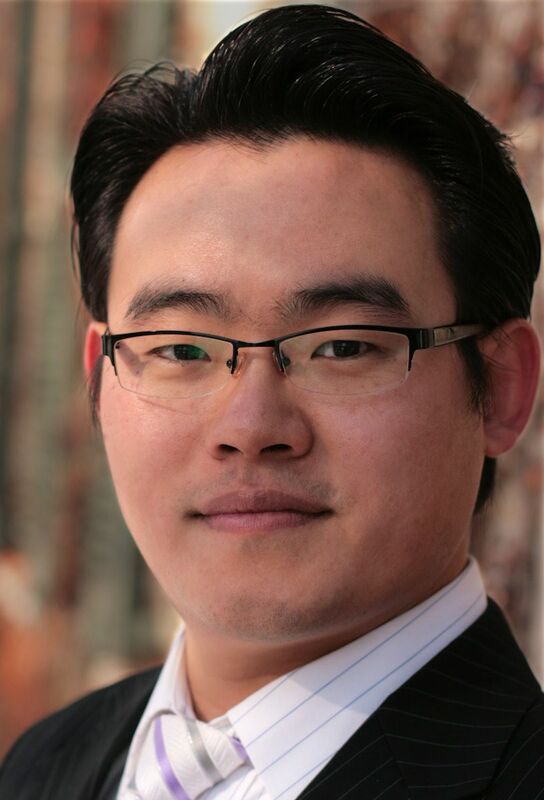 Tenor, Dr. Yongmin Kim is an artist and educator who enjoys an extensive performing career in Opera, Oratorio, and Concert singing. Dr. Kim holds the Doctor of Musical Arts degree from the University of Michigan where he studied with Stephen Lusmann and Master of Music degree in Voice Performance and Literature from Eastman School of Music under the tutelage of Robert Swensen. While at Eastman, Dr. Kim performed as the Count in Mozart's Le Nozze di Figaro with Eastman Opera and sang the title role in Felix Mendelssohn’s Elijah with the Eastman-Rochester Chorus. He has appeared as soloists numerous times in Korea and the southeast Michigan area, both on the opera and concert stages. After making the successful transition from baritone to spinto tenor repertoire at the University of Michigan, he made his debut at Michigan Opera Theatre as the Messenger in Verdi's Aida. Dr. Kim appears frequently in concert with credits including Beethoven’s Symphony No. 9, Choral Fantasy, Mass in C, Faure’s Requiem, Mozart’s Coronation Mass, Requiem, and Missa Brevis in G, Handel’s Messiah, J.S. Bach’s St. Matthew Passion, B minor mass, Christmas Oratorio, including his many cantatas, Mendelssohn’s Elijah, and Haydn’s Creation, Missa Nelson. Recently he appeared at Eastern Michigan University and the Community Chorus of Detroit as a tenor soloist of Beethoven Symphony No. 9. He has had the privilege of working with renowned musicians such as Martin Katz, Jerry Blackstone, György Rath, Steven Mercurio, Benton Hess, William Weinert, Kathleen Kelly, Russell Miller, and Timothy Creek. As a passionate educator, he teaches at Eastern Michigan University and has maintained a private voice studio in Ann Arbor and Novi. His voice techniques are based on the Italian "bel canto" tradition and encompassing the knowledge and expertise gained by many years of study, teaching and performing. Also, Dr. Kim is carrying on the lineage of the master teachers Stephen Lusmann, Andrew White, Sidney Dietsch, and Giuseppe DeLuca. In addition to his degrees in vocal performance, he also holds a master degree in Choral Conducting at the University of Michigan under tutelage of Jerry Blackstone, and a master degree in Church Music at Presbyterian University and Theological Seminary in Seoul, Korea. His conducting teachers also include Kenneth Kiesler, Eugene Rogers, William Weinert. As an active conductor, he has appeared as a guest conductor, clinician, and workshop presenter for many festivals in Korea and the US. Moreover, committed to the commissioning of new music, he has been trying to create and share music with local communities. Dr. Kim is currently the worship & music director at Korean Presbyterian Church of Metro Detroit in Southfield, MI. He is a member of the National Association of Teachers of Singing (NATS), the American Choral Directors Association (ACDA), and The College Music Society (CMS).